Soups are a great way to warm you up on a cold day but, as the temperature rises, you may want a slight variation. A cold bowl of soup can be a refreshing alternative. This healthy recipe calls for cream or sour cream, which has a cooling effect on the soup. 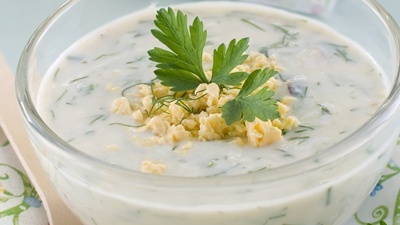 Traditionally, potato-leek soup is a Northern European favorite, mainly in England and France. Leeks, a popular vegetable in the United States, Asia and France, belong to the same food family as onions and garlic. They have sulfur-containing phytonutrients which have anti-inflammatory and antioxidant benefits to the body and can promote liver function. Leeks also contain antioxidant compounds that convert to allicin when cut or crushed. Allicin helps to lower blood pressure and the overall risk of coronary artery disease and stroke. As for the humble potato, as long as you’re not eating a lot of processed potato products, such as French fries and potato chips, potatoes can have a number of health benefits. They are full of nutrients such as vitamin B6, vitamin C, potassium and fiber. Potatoes are also good for the heart because vitamin B6 helps keep levels of homocysteine in check; high levels of this amino acid in the blood have a strong association with an increased risk for stroke and heart attack. The power combination of leeks and potatoes can make for a perfect heart-healthy food. Enjoy this leek and potato soup with family and friends. as it feeds six to eight people. Put the vegetable stock and potatoes in a large pot and bring it to a boil. Reduce to medium heat and simmer for 15-20 minutes. Along the length of each leek, make a slit, and rinse them well under cold running water. Slice the leeks thinly. When the potatoes are starting to get tender, stir in the leeks and season with sea salt and the freshly ground black pepper. Simmer for 10-15 minutes and stir occasionally until the vegetables are soft. If the soup is too thick, thin it down with more of the stock or water. If necessary, puree the soup in a blender or food processor in batches. If you are using the crème fraiche or sour cream, stir it in, cool and chill. Garnish with a swirl of cream and snipped fresh chives. It is now ready to serve. Fraser, L., Best-Ever Vegetarian, The Definitive Cook’s Collection: Over 200 Mouthwatering Step-by-Step Recipes (Wigston; Anness Publishing, 2013), 37. Mateljan, G., The World’s Healthiest Foods: Essential Guide for the healthiest way of eating (Seattle: George Mateljan Foundation, 2007), 278, 296. “Leeks nutrition facts,” Power your diet web site; http://www.nutrition-and-you.com/leeks.html, last accessed April 10, 2014.